Daniel Corr, Ed.D., is the Vice President of Academic and Student Affairs at Scottsdale Community College in Arizona. Previously, he served as the Associate Vice President for Academic Affairs at Harper College in Illinois and as the Dean of Academic Enrichment at Waubonsee Community College, also in Illinois. Dr. Corr received a Bachelor of Arts in Liberal Studies from the University of California, Santa Barbara, a Master of Arts in Educational Administration from Governors State University in Illinois, and a Doctor of Education in Educational Administration from Argosy University, again in Illinois. Paul Dale, Ed.D., is the President of Paradise Valley Community College in Arizona. Previously, he served as the Vice President of Learning Support Services and Vice President of Student Services there. Dr. Dale received a Bachelor of Science in Sociology from Iowa State University, a Master of Science in Guidance and Counseling from the University of Wisconsin -- Whitewater, and a Doctor of Education in Educational Leadership from Northern Arizona University. Vernon Smith, Ph.D., is the Vice Provost for Distributed Learning at the University of the Pacific in California. Previously, he served as the Provost and Chief Academic Officer at MyCollege Foundation/Portmont College Mount St. Mary's University in California and the Vice President of Academic Affairs at Rio Salado College in Arizona. Dr. Smith received a Bachelor of Arts in Latin American Studies and Spanish and a Master of Organizational Behavior from Brigham Young University in Utah, and a Doctor of Philosophy in Organization and Administration of Higher Education from the University of Arizona. More information about the candidates' backgrounds and accomplishments can be found on the presidential search website at http://www.azwestern.edu/Office_of_the_President/board/president_search/. Each presidential finalist will participate in open public forums January 19 -- 21. These forums are open to faculty, administrators, staff, students and the community. For the convenience of attendees, there will be a morning session and an afternoon session each day in the Schoening Center (3C College Community Center on the AWC Main Campus). The forums can also be viewed via videoconference at the Alicia Valdez San Luis Learning Center and the Parker Learning Center. 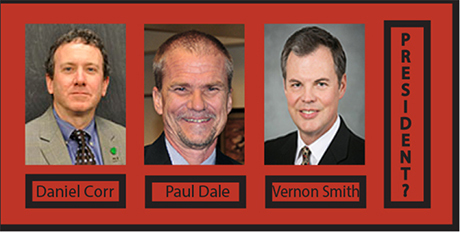 Dr. Vernon Smith, Tuesday, Jan. 19, 2016, 9:30-11:00 a.m. OR 1:00-2:30 p.m.
Dr. Daniel Corr, Wednesday, Jan. 20, 2016, 9:30-11:00 a.m. OR 1:00-2:30 p.m.
Dr. Paul Dale, Thursday, Jan. 21, 2016, 9:30-11:00 a.m. OR 1:00-2:30 p.m.